Stiltwalkers led the lantern parade through the streets of Hillcrest. 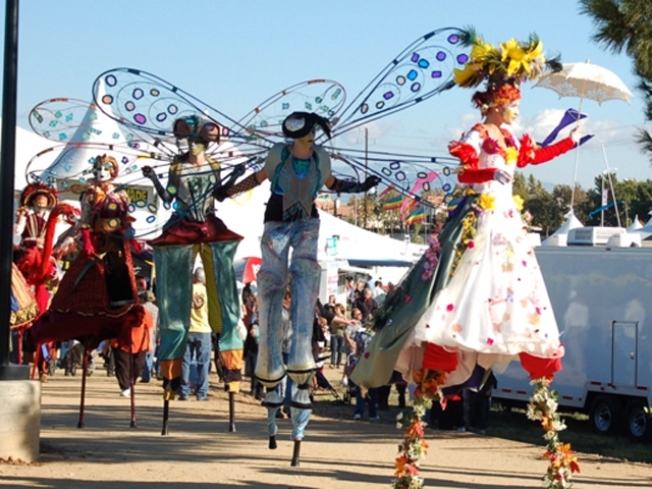 Thousands of San Diegans flocked to the vibrant community of Hillcrest Sunday to celebrate CityFest 2009! The annual street fair, held under the Hillcrest street sign on Fifth Ave and University, was grander than ever before, with more than 250 arts, crafts and food vendors. Locals also celebrated the community's unique spirit with hours of live music on the grand stage, a local showcase and a rededication of the famed neighborhood sign. There was also a "Spirit's Garden" beer garden, food court, kids carnival and a celebratory lantern parade at dusk. Festivals goers kept cool in the pool, hosted by the hip Hillcrest bar, Babycakes. Click here for more Hillcrest events and happenings!